Calling all future stars! 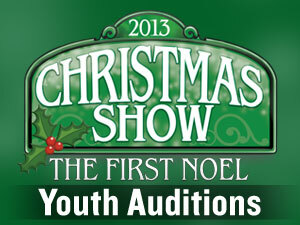 AMT is excited to invite YOU to audition for the ALL NEW 2013 Christmas Show: The First Noel. Join us for a fun-filled experience with singing, dancing and Christmas cheer. The AMT Christmas Show is a holiday tradition and an opportunity to perform in front of thousands of people! Seasoned performers, especially those with dance experience, ages 7-15, male or female, are encouraged to audition. You must call the AMT Box Office for an audition appointment; sign-ups will be hourly in groups of 20. Call early, available times will fill up quickly. SEE YOU THERE! Please be prepared to sing your favorite Christmas song a cappella as well as learn a dance combination. Please wear appropriate clothing and dance shoes or sneakers. The 2013 Christmas Show: The First Noel runs November 5 – December 30, 2013. Youth cast will be divided into teams and the teams will be scheduled throughout the run so they will not do every performance of the entire run. Call the AMT Box Office at 717-397-7700 or 800-648-4102 for more information and to sign up for an audition time.